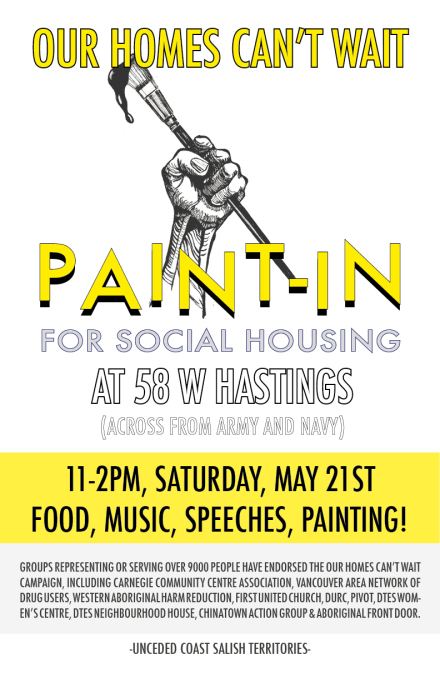 On Saturday, May 21st, Our Homes Can’t Wait is organizing a community paint-in party at 58 West Hastings, with food, speeches, painting and music. The City wants to build a gentrifying social mix project at 58 W Hastings, with only a fraction of the units going to low-income people on welfare and pension. Come on May 21st and join us in sending a message to City Hall that we are united and we won’t be policed out, priced out or pushed out of the DTES! We need decent housing we can afford! Join us for food, speeches, drumming, music, painting and FUN! All ages are welcome and non-toxic paints will be available for children to use. Groups representing or serving over 9000 people have endorsed the Our Homes Can’t Wait Campaign to get 10 sites for 100% welfare, pension rate social housing in the Downtown Eastside, improving and saving SRO hotels and a rent freeze. The groups have also endorsed a community vision for 58 W Hastings. The community vision is so far 100% social housing at welfare rate housing Indigenous, Chinese, homeless, and SRO residents, with at least 50% of units for women and some units for people with disabilities. The building would be run by and accountable to residents similar to the way co-ops are run, with residents covered by the Residential Tenancy Act and residents trained and paid to provide maintenance; Bottom floor to be free meeting space for community, cultural supports and peer services and amenities like garden on top, balconies, fitness room. Units should be a minimum of 500 sq. ft in size. The Our Homes Can’t Wait campaign and the community vision for 58 W Hastings has so far been endorsed by: Carnegie Community Centre Association, Carnegie Community Action Project, Vancouver Area Network of Drug Users, Western Aboriginal Harm Reduction, First United Church, DURC, Pivot, DTES Women’s Centre, DTES Neighbourhood House, Chinatown Action Group and Aboriginal Front Door. The event will be taking place on the unceded coast salish territories of the Musqueam (xʷməθkʷəy̓əm), Tsleil-Wauthuth (Səl̓ílwətaʔ/Selilwitulh) and Squamish (Skwxwú7mesh Úxwumixw) peoples.